Sure, you've had grilled salmon before, but have you tried grilled salmon with a pesto-cream sauce? Made with PHILADELPHIA and basil pesto, this sauce turns grilled salmon into a delectable entrée. Brush both sides of fish with oil; sprinkle with salt and pepper. Grill, skin-sides down, 10 min. or until fish flakes easily with fork. Meanwhile, cook cream cheese product and milk in saucepan on medium heat 2 to 3 min. or until cream cheese is completely melted and sauce is well blended, stirring constantly. Stir in pesto. Serve fish topped with sauce and parsley. Round out the meal with hot cooked rice and steamed vegetables. 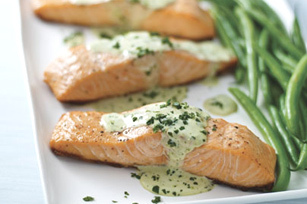 For added flavour, drizzle cooked fish lightly with fresh lemon juice before serving.